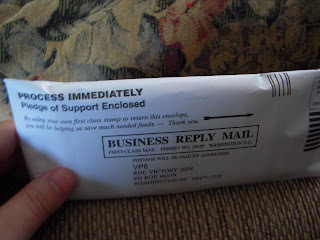 They sent me a fundraising letter--with a postage paid envelope included. They'd better be glad it wasn't one of those Fed-Ex envelopes, or they'd really be paying the price. Instead, they're getting about three months worth of pages from the NY Times Crossword puzzle desk calendar, a takeout menu from a local Chinese restaurant, and some assorted paper detritus from the top of my desk. I would like to thank the McCain campaign for making it easier for me to clear some of this mess up, and for getting me back on track with my daily crossword.